What a great way to engage students. 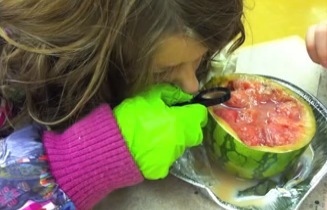 This Youtube clip, Decomposition lab by Amy Park shows year four students investigating changes as their chosen piece of fruit decomposes over a 2.5 week period. Its great to see the students so engaged, and learning so many great inquiry skills. Even parents can participate. What lessons can museums, or history classes glean from the process here? What activity could you investigate over a period of time. Could a period of a couple of weeks become a timeline that might be acted out and videoed? What daily measurements might be taken? Could a current issue be tracked day by day – measured, plotted? Perhaps it could be a walk down a street through time.